I don't carry much for skincare, but I want to get a couple more water based moisturizers. I have the cult favorite Embryolisse Lait Creme, and Limelight by Alcone Must Dew. I absolutely love Must Dew because it hydrates the skin instantly and it helps the foundation to glide on easily. I don't love the Lait Creme because I find it too greasy, but I'm going to use it until I finish the tube to avoid wasting product. I just bought Weleda Skin Food, which is like a hybrid of Must Dew and Lait Creme, and it's only $10 at Target! This is fantastic for extremely dry and rough skin. (prices may differ from online and in store, so double check) For makeup removers, I carry Bioderma Micellar Water and Target brand waterproof makeup remover. I find that it works just as well as more expensive brands. I can't forget my trusty Skin-Up! It's a device that delivers an extremely fine mist to help hydrate the skin and retain moisture. The serum that comes with the device is a sophisticated blend of hyaluronic acid and antioxidants. Whenever I use this on clients and models, I find that makeup sits better on the skin. Kevyn Aucoin's Sensual Skin Enhancer has been in my kit for half a year and I love it so much. It works on a variety of skin types and the shade range is amazing. I use it both as a foundation and concealer. I recently added MAC Face and Body for models or clients with nearly perfect skin. I also have Kryolan Dermacolor concealers and correctors for spots that need intense coverage, but I haven't been using it as much because I mainly use Kevyn Aucoin. I'll occasionally mix in the peachy shade from Kryolan to use under the eyes. In the same palette, I have Ben Nye Fireworks and Cream Blush. Update: I have most of my liquids depotted into Muji tubes which you can find here. I finally got my hands on to the Stila Convertible Color palettes and I really love how these create a fresh and dewy stain on the lips and cheeks. I'm a big fan of Becca Cosmetic's mineral blushes because the formula is amazing. It's finely milled and extremely pigmented, meaning it applies and blends beautifully. Becca also makes one of the best liquid highlighters. I tend to use the liquids more than their powders because they're more versatile and melt into the skin. I only carry Pearl, Opal, and Rose Gold, but Pearl is my most used. One of my new favorites is Kevyn Aucoin's Celestial Skin Liquid Lighting. This liquid a lovely soft gold that contains finely milled shimmer. My good friend Courtney Dailey launched a new cosmetics line called Coco Ensoleillé and she has this amazing product called Face Magnifique. It's the highlighter of everyone's dreams. This comes in two shades, but I use the champagne shade the most. I love mixing a tiny amount with a moisturizer to give the skin a soft glow; I use this mixed with body lotion as well. For bronzer, I have NARS Liquid Laguna. It's one of my favorites because it seamlessly blends into the skin, like liquid sunshine in a bottle. On some skin tones, it can look a little peachy/red so I eventually want to get the Chanel Soleil Tan De Chanel. I RARELY contour models and clients, but if I do, my product of choice is the Viseart Highlight and Sculpt palette. The lightest contour shade is perfect for very fair skin tones. It has a grey undertone, meaning it'll mimic a shadow instead of being an orange stripe. The medium shade is a little to warm for my liking, so I'll mix it with a little bit of the lightest shade. Last, but not least, is powder. I've had my RCMA No Color Powder for a few years AND THE BOTTLE IS STILL HALF FULL. It sets foundation beautifully and works on all skin tones. After hearing a couple of friends talk about how incredible the Purely Cosmetics Diamond Perfect Finish Powder is, I decided to order one! It's designed to blur any fine lines and pores on the face, and works really well under the eyes. This powder is very similar to the MUFE HD Powder, just without the flashback. That's pretty much all I have for face products. 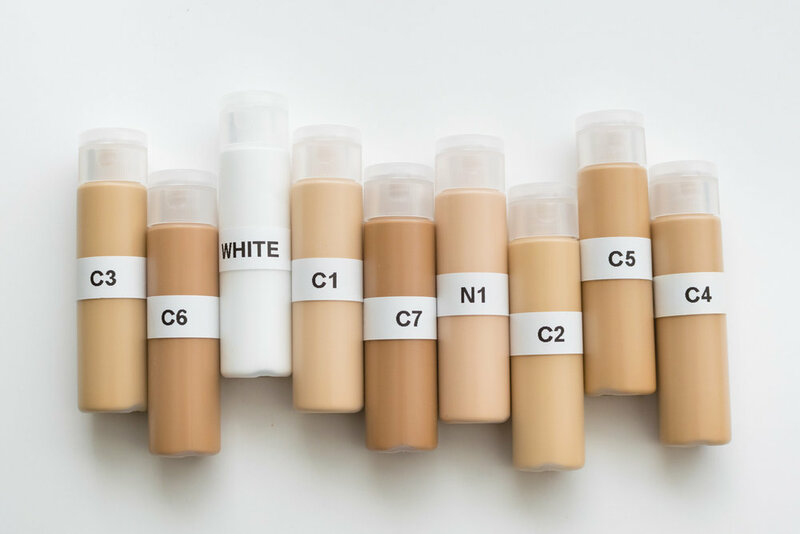 What are your favorite foundations? I'm always looking to try new ones to add to my kit. Let me know in the comments below!